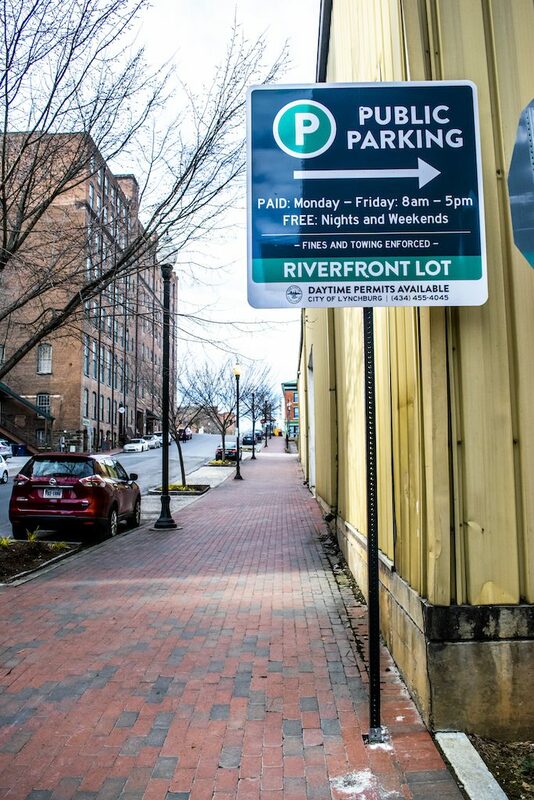 Jefferson Street in downtown Lynchburg – a street lined with small businesses and local restaurants – experienced a change Feb. 4 when paid parking was implemented in three parking lots where customers and employees could previously park for free. According to Lynchburg Parking Manager Dave Malewitz, the decision to implement paid parking is part of city hall’s long-term project to improve the city of Lynchburg. Malewitz said many local business owners who have property on Jefferson Street were in favor of implementing paid parking because they had received complaints from customers that it was difficult to find parking near their businesses and restaurants, due to over-crowding of the free lots. 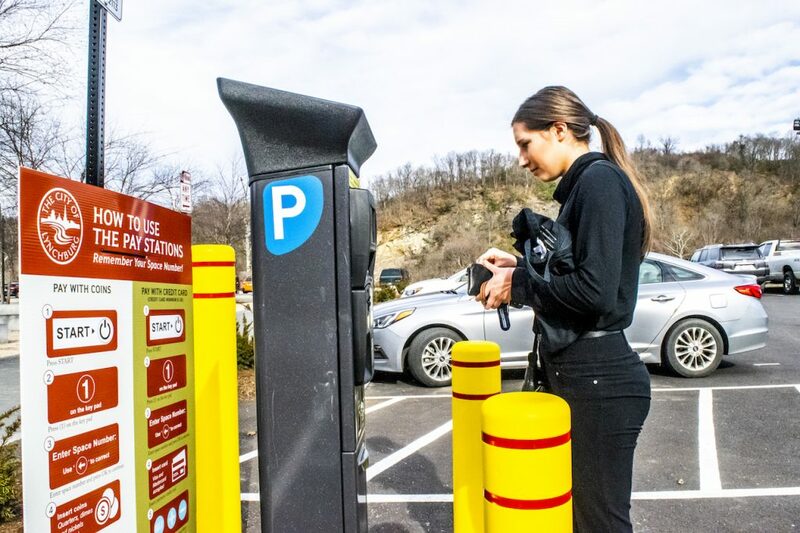 PAY TO PARK — Guidelines are set up at pay stations to help visitors understand the new pay system in the Jefferson Street parking lots. According to Malewitz, there will still be free parking areas on Jefferson Street, but there will be enforced limits on how long drivers can park their car at the free spots without cost. According to the News & Advance, drivers wanting to park in the Jefferson Street lots Monday through Friday from 8 a.m. to 5 p.m. will now have to pay a fee of $0.25 for the first hour and $1 for each additional hour, up to $5 per day. Residents can purchase a parking permit for $25 per month and businesses can purchase permits for $40 a month. Malewitz told the News & Advance that the paid parking would generate $39,000 in annual revenue for the city. Drivers will now find paid parking stations in the lots. Signs will remind drivers to pay attention to their lot number and direct them to make a payment at the station before leaving the lot. According to Malewitz, the city will be giving a 30-day grace period before ticketing drivers for not paying for their parking spots, since the paid parking is in its beginning stages. While this change will affect customers looking to visit the local businesses on Jefferson Street, employees working at the businesses will also be affected. Caleb Burkhart is a barista at Dublin 3 Coffeehouse on Jefferson Street. As a college student and regular at his workplace during the week, Burkhart and his fellow co-workers had been aware of the upcoming change, but hopeful it would not come so suddenly. TRANSITION — Opinions are mixed when it comes to the bene ts of the new paid parking options downtown. “For employees that have to be here through the week constantly, it’s kind of ridiculous that (we) have to pay for parking,” Burkhart said. Burkhart believes that the paid parking will impact the length of time customers will want to spend in the coffee shop and in the surrounding businesses, due to the added expense of parking. To accommodate customers, Dublin 3 Coffeehouse announced Feb. 4 on their Facebook page that they will reimburse customers for their first hour of parking in Lot P, located across the street from the shop, if they bring in their receipt to show when ordering. Macy Blankenship is a Liberty student who interned at Lynchburg’s local record shop located on Jefferson Street, Speakertree, over the summer. Blankenship worked at the shop frequently throughout the summer and helped the business run events. She also has concerns about the added expense the parking will be for business owners. “Business owners can’t change their place of business on a whim, and parking is an added expense they’ll have to pay for now,” Blankenship said. While many hold mixed opinions about the parking process, Malewitz is hopeful that this new installment will benefit local business owners and their customers in the area and nullify the concerns many customers and owners expressed over the lack of parking near the businesses.